SAL DeTRAGLIA'S VIRTUAL TAPAS BAR: MARATHON MAN. It has been brought to my attention that—with my 38th birthday a month or so away—I’ve nearly reached middle-age. Most mathematicians would, in fact, round me up to forty. This disturbing realization led to a bout of internal reflection—from which I emerged determined to improve my physical fitness. Now, in fairness to myself, I’m not exactly a poster-boy for sloth. I’ve regularly engaged in vigorous physical activity since my early teens. It’s just that my activities to date—i.e., compulsively lifting heavy pieces of iron, or kicking people in the head while dressed in a bathrobe—no longer befit a man of my advanced years. So I decided, earlier this week, to begin jogging. This seemed like a brilliant idea. 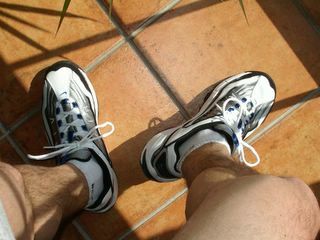 Jogging would strengthen my heart, burn my abundance of nervous energy, and expose me to fresh air and Iberian sunshine. Brilliant, indeed, except for one glitch—I HATE jogging. I hated it in gym class. I hated it during my three years on the high school track team. And I was fairly certain that I’d hate it in middle-age. But I decided to give jogging another shot, hoping that it might prove more enjoyable when done of my own free will—rather than under the dictate of a whistle-tooting man in nylon shorts whose other job duties involved herding reluctant teenage boys into a communal shower. Well…I’ve now got two days and five kilometers of jogging under my belt; and thus feel empowered to make some comments. First, the good things about jogging. The shoes! Spongy, yet firm. Springy, yet stabilizing. Resistant, yet breathable. Light, sleek and comfy. Jogging shoes are an engineering marvel! They are the greatest things to wrap around one’s feet, barring the fingers of a Swedish masseuse. In fact, I’ve no doubt that the majority of Earthlings would wear jogging shoes twenty-four hours per day, seven days per week, and to the exclusion of all other footwear—were they not so bloody ugly. But, my God! They ARE ugly. I can’t think of any other garment that so habitually combines the colors fluorescent yellow with reflective silver. If there’s a scientific reason why brown suede is incompatible with aerobic exercise, I’d like to hear it. Now for the bad things about jogging. Yet despite these bitter-sweet conclusions, I will continue to jog. I finally have my own private shower, and it’d be shame to waste it. In my case the fluorescent yellow and reflective silver that you disdain so much serve a very important purpose - to distract people from looking at my legs which, apart from being pale and hairy, would look better attached to a stork. Indeed, a stork wearing fluorescent yellow and silver jogging shoes would probably attract less derision and sniggering. LOL! Damn...I love the British sense of humor! Sorry, I meant "humour." Your comment is enlightening. It not only highlights the relevance of the yellow/silver color (sorry, "colour") combo, but also explains why I've yet to see any black patent-leather jogging shoes for sale at my local Decathon store. Ummmm...can I skip the football, and just concentrate on the pints? Oh no - no, no, no! 38 is NOT middle age, not even close! I know this because I have a few years on you and I have not yet reached middle age. I'm actually thinking I may skip it altogether. Don't be scaring me like that, Sal! Yours is a healthy attitude toward mortality. But truth be told, I won't be scared by middle age if/when it finally arrives. Why? Because it can't possibly be worse than being a teenager. Actually, it's not age that I care about - I earned my years and I'm proud of them! And I'm looking forward to old age. I just hate the title and surrounding concepts of "middle-age". Being young and foolish is acceptable - being old and foolish (or wise) is acceptable but being "middle-aged" is just so uncomplimentary - especially if you're middle-aged and foolish! I'll have to get a new sporty convertible (that would be okay), dump my wife for a younger trophy woman - oh wait I am a woman... and I'm single... okay, start hitting on really young guys (oh, Mrs Robertson!) and either be responsible and boring or disgracefully irresponsible. So nearly 40? Don't you think it's about time to leave sport for children? Except for the Greeks, who are certainly a good counter-example, I've heard no records of any decent civilisation praising more physical exercise than strictly necessary. You are correct. When thought about logically, jogging is a silly waste of energy. However...if a large carnivorous animal should ever prowl about my neighborhood, it will feast on the meaty buttocks of my neighbors before it finally catches me. SEMINAL WORKS OF RELIGIOUS ART. LET’S PARTY LIKE THERE’S NO TOMORROW! ODE TO A SICK SPECTACLE.